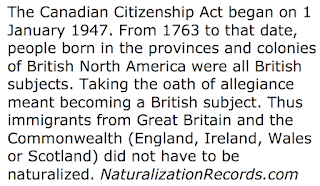 Olive Tree Genealogy Blog: Canadian Naturalization Records, 1915-1951 database Update! Canadian Naturalization Records, 1915-1951 database Update! The following announcement just came in from Library & Archives Canada. This is great news! I can search for my husband's great-grandfather from Belgium now. Library and Archives Canada is pleased to announce the release of a new version of the online database Naturalization Records, 1915-1951. The nominal index has been extended with the addition of more than 68,000 names and now covers the years from 1915 to 1944, inclusively. Work is ongoing to extend the nominal index to 1951, and volunteers are welcome to help. Those interested should write to Cdn-Nat-Coord@jgs-montreal.org. This database is one of the few Canadian genealogical resources specifically designed to benefit researchers having roots other than British. The reference numbers indicated in the database can be used to request copies of the original naturalization records, which are held by Citizenship and Immigration Canada. Library and Archives Canada would like to thank the Jewish Genealogical Society of Montreal and its volunteers, without whom this project would not have happened. For those wondering "Why not British?" 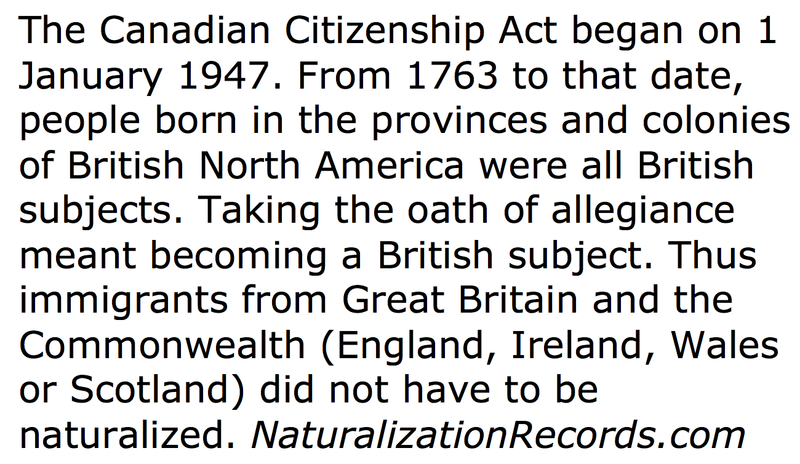 the answer is found on my website NaturalizationRecords.com (and in the graphic above) along with access to free naturalization and passport records and information on the Naturalization Process in both Canada and USA.